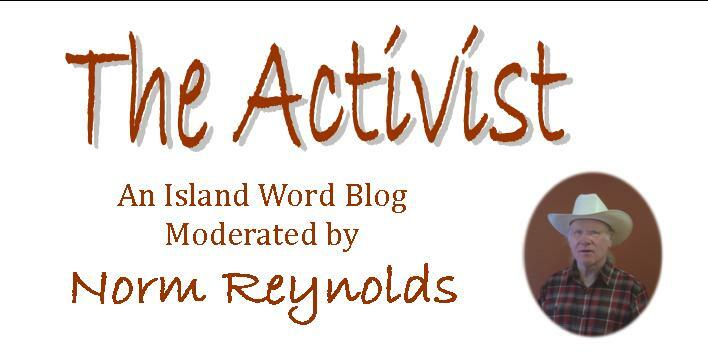 Last week The Activist post Courtenay Resident Champions DIY Steps to Reducing Carbon Footprint kicked off the search for Comox Valley examples of how we as individuals can live better lives while reducing our carbon footprint. Already I have heard from several others with efforts they are making to lead better lives while contributing to creating a healthier planet. I am hoping to gather enough information about working/workable sustainability strategies in the Comox Valley that The Word can publish an entire edition of the paper on Living Well: A Primer of Sustainable Living in the Comox Valley. However such a primer would need to look at collective actions as well as individual ones. 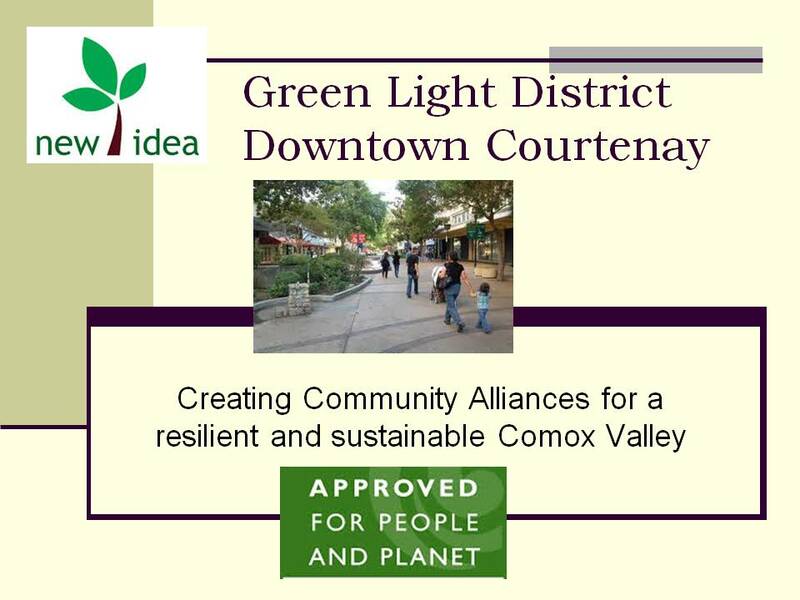 This week I want to look at two fascinating ideas: one is the Green Light District proposal by Comox Valley Transition Town. 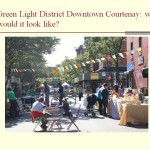 Go to http://www.slideshare.net/normgr/green-light-district to see a slide presentation outlining what developing a green light district in Downtown might look like and what it could mean to our community. 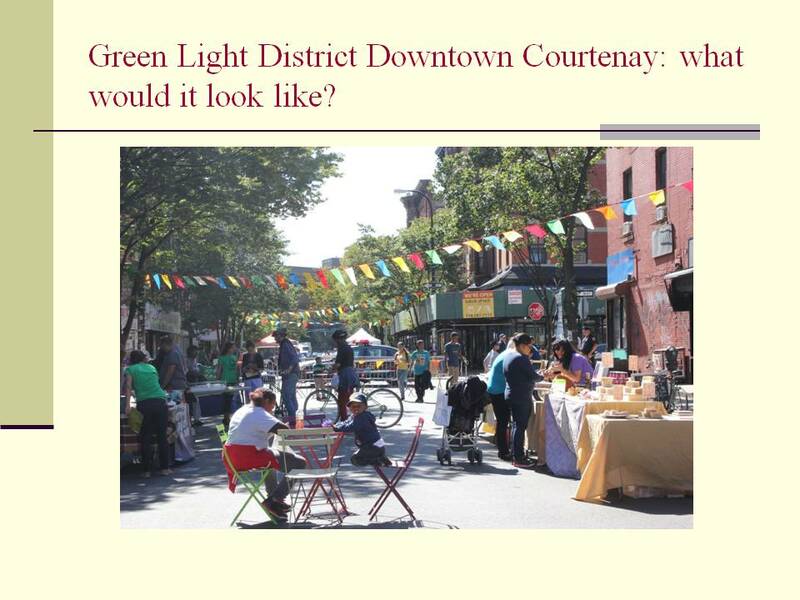 The other—related—idea for creating the residential basis of a vital downtown that has come up following the Courtenay Council sponsored Downtown forum. 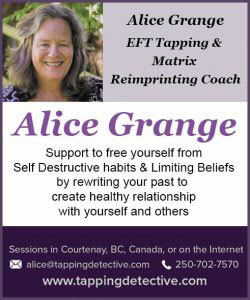 • be a win win for everyone in the Comox Valley. 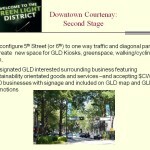 • be very good for the valley’s economy and especially downtown businesses. • be great for artists of all sorts. • be tremendous for residents of the valley who want to continue to have a community with a sense of locality, heritage, culture and belonging. • be a real boost for those who want to preserve the environmental quality of our valley. • It would be FUN! We can build a healthy, diverse and sustainable valley as well as downtown economy by focusing on quality goods and experiences, by bringing together our business, arts, social justice and environmental communities. 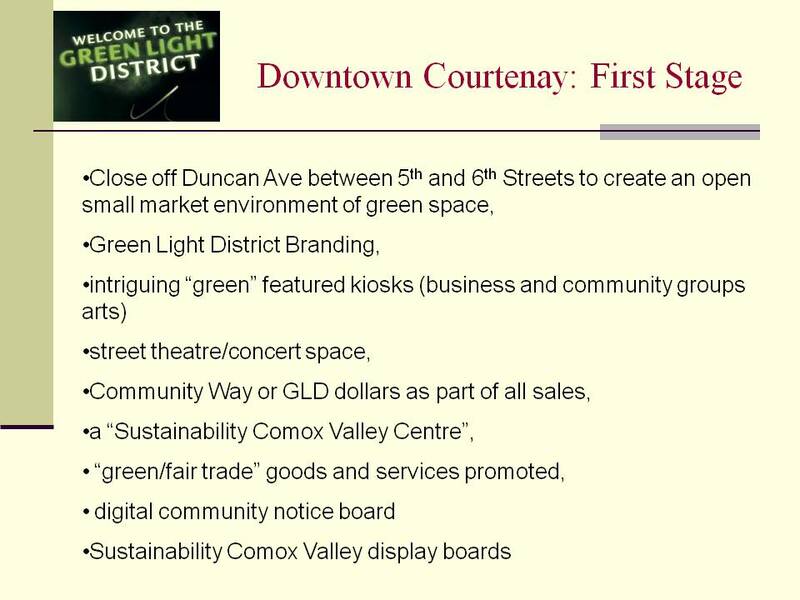 A Green Light District in Downtown Courtenay would vitalize our downtown and contribute to building alliances for a sustainable community that we will all be proud and delighted to be a part of. 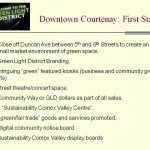 The other visionary idea, triggered by the Courtenay Council sponsored Downtown Forum, is complementary to the Green Light District proposal in that it-let’s call it the Courtenay Downtown Densification Project (CDDP)—would ensure there would be the number of people in the downtown area to form the basis of a highly successful downtown district. The CDDP would see two blocks of the downtown redeveloped into four storey buildings with shops on the first floor, services on the second floor, residences on the third and fourth floors and open-market environment/dining on the roof top with its grand views of ocean, mountains and glacier. Wow! Would that be a vital downtown?! The really interesting thing about the CDDP is that it comes with its own funding mechanism and it is not going to the pocket books of Comox Valley residents and businesses. It is about capturing new value out of the revitalization that it helps create and about a new form of community investment with clear public as well as private benefits. CDDP notes that “No single developer could/would take on a project at the scale of CDDP . However there is a new enthusiasm in the development, community and government circles that is looking with fresh eyes at community development that has significant social benefit as well as Return on Investment. In the ground breaking new book, The Resilience Imperative, by Michael Lewis and Pat Conaty the authors provide examples of cooperative and inclusive ownership models for community control of energy, housing, food production, manufacturing, finance, and social services from many countries. People all over the world are trying to recover local control over their resources and productive assets, reacting to the growing ownership of these assets by international capital, and the trade deals that protect these investments. The growth of the social economy (economic democracy) shows that given the right opportunities, ordinary citizens would much rather invest their savings in local enterprises than in conventional financial markets. The movement has already spread to governments that are developing policies to promote this exciting new turn in economic/community development. This new “social economy” includes non-profit and co-operative enterprises, and corporations that have a legal responsibility to the community and environment – along with the financing vehicles to leverage community investment in these enterprises. Already Vancouver is creating housing for families that cannot break into the city’s astronomical real estate market. A new private investment fund, New Market Funds, will put money into a plan to build 360 units of subsidized housing on city land. The units are mostly intended for those earning less than Vancouver’s median income, about $74,000 per average household and about $40,000 for single-parent families. Vancouver is providing four pieces of city land worth $22-million to a new organization, the Vancouver Community Land Trust Foundation, to build and manage a mix of units that will be rented at different rates: just below market, slightly subsidized and heavily subsidized. The project will not rely on help from the provincial or federal governments! The project has raised $11-million from foundations and individuals to invest in the housing development. In 2013 the BC government developed a new type of hybrid business model to respond to projects like the CDDP. A Community Contribution Company (C3) designated company/organization has a legal obligation to conduct business for social purposes and not purely for private gain. This obligation will help attract capital not currently accessible to the social enterprise sector by appealing to philanthropic investors who still expect some financial return. They differ from a typical private company in that they are subject to an “asset lock”. There is a strict cap on dividends that can be paid out to shareholders. The bulk of a C3’s profits must go toward the C3’s community purposes or be retained or transferred to a qualified entity, such as a charity. What a model for implementing Courtenay’s CDDP! It can be done! 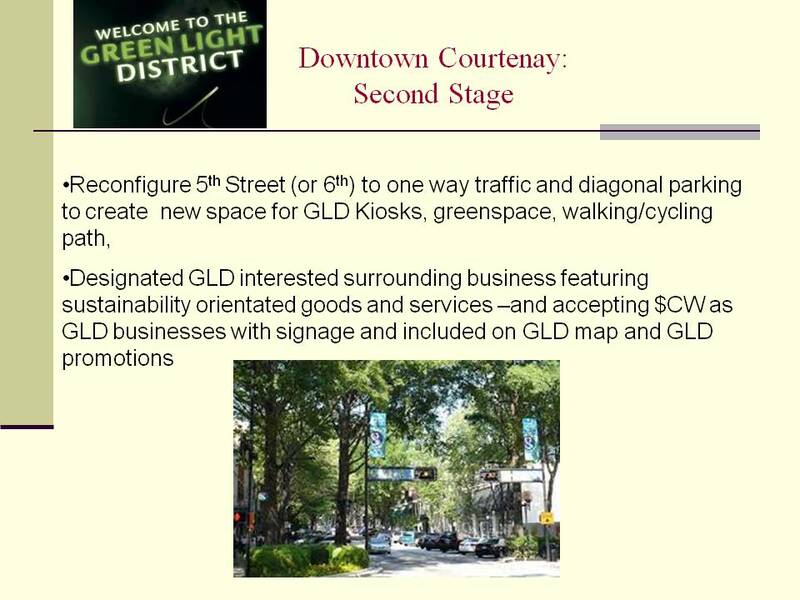 Both of these ideas-Green Light District Downtown Courtenay and the CDDP would—if implemented—put Courtenay on the map as a leading community in downtown revitalization. 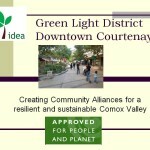 These ideas would not only revitalize, in a profound way, the crumbling downtown Courtenay core that has been so hard hit by big box development at the margins, they would also form the basis of revitalizing our Comox Valley commitment to building a more just, sustaining and sustainable community. It would be a huge step up in constructing more local and resilient economies, and taking back ownership of our future.